A few days ago, my mum's lovely friend M. invited me around for dinner. She cooked us a truly yummy meal and then offered to pick me a punch of herbs from her garden to take home. 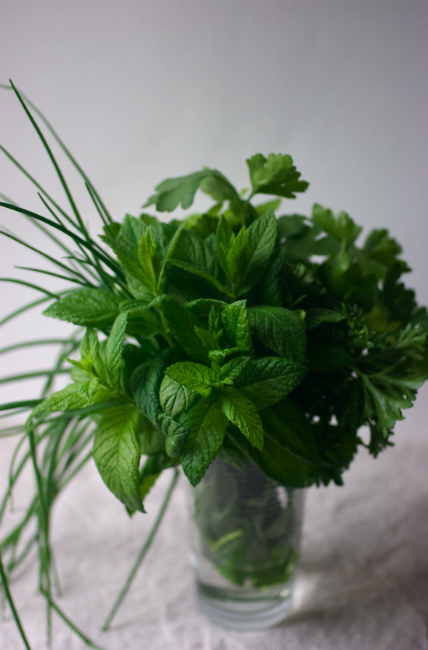 She came back with a gorgeous bouquet of mint, chives, parsley and coriander. They're such a beautiful deep green. To thank her for her generosity both that night and in the past few years while I've been here, I decided to make her a cake. I had bought a box of fresh blueberries to use in my Swiss Roll, but hadn't used them, so they formed my key ingredient. 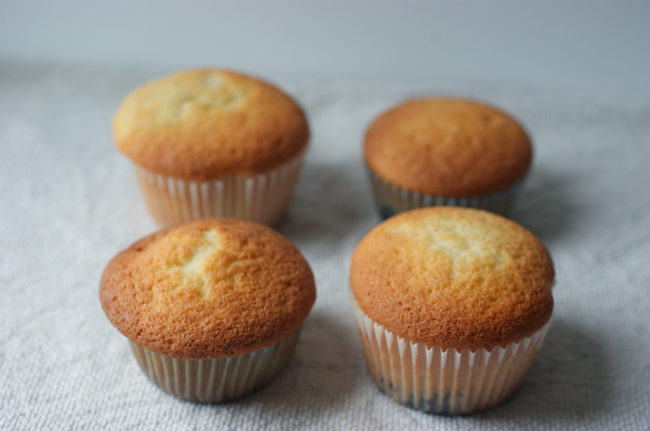 I also had a lemon left over from the lemon curd, so I had a look at foodgawker and came up with this recipe. I decided a loaf would be easiest to wrap and transport. 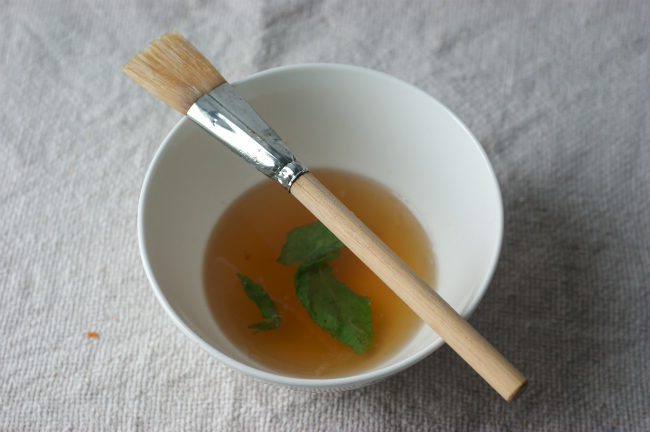 To include some of her wonderful herbs I steeped mint in a simple lemon syrup. I'm so glad I tried this out on a whim - it tasted fantastic. I would have happily sat down and consumed the whole bowl. I was really pleased with this loaf recipe - it's a beautifully light sponge and very moist and tender. I'll definitely be using it again. The syrup finished it off with a lovely and slightly unusual note - a simple lemon juice and sugar crust would also be yummy if you don't have the mint. Preheat the oven to 175C/350F. Line a loaf tin with paper or grease well and flour. Cream the room temp butter and sugar together until very light and fluffy (five minutes or so). Combine the flour, baking powder and salt in another bowl. Add an egg and beat in on low, then add the other egg. You may need to add a tsp of the flour mixture in between. Alternately add a few tablespoons of flour and a splash of milk until fully combined. 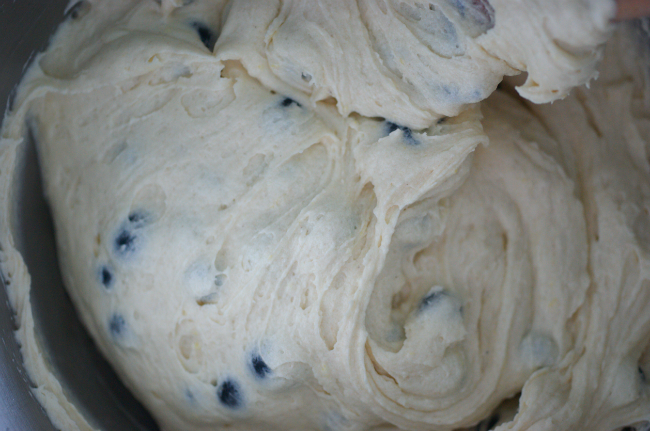 Stir in the blueberries and zest then spoon into the loaf tin. Bake for about 1 hr, testing with a skewer or similar. Leave to cool for five minutes before applying syrup (see below). Mix all the ingredients together in a small pan or a microwaveable jug - I just blasted mine for a few minutes, stirring regularly till the sugar had dissolved. You could also do this in a small saucepan. Leave to cool and steep while the loaf cooks. When it has cooled for five minutes, start brushing the syrup over the top with a pastry brush. Use a small knife or a skewer to make some incisions on the top at regular intervals and fill with syrup. Keep brushing over and letting it sink in until it is all absorbed. Leave to cool fully then slice. It was delicious! There was just a very subtle hint of mint, which was a lovely contrast to the blueberries and the sweet cake. 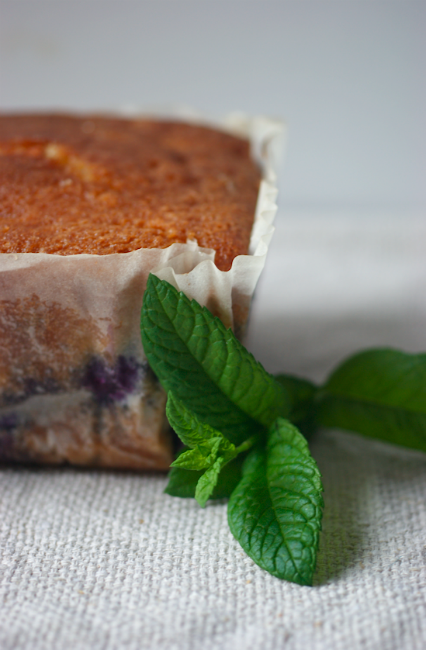 The lemon / mint syrup sounds like a great idea and a lovely complement to the blueberry loaf. 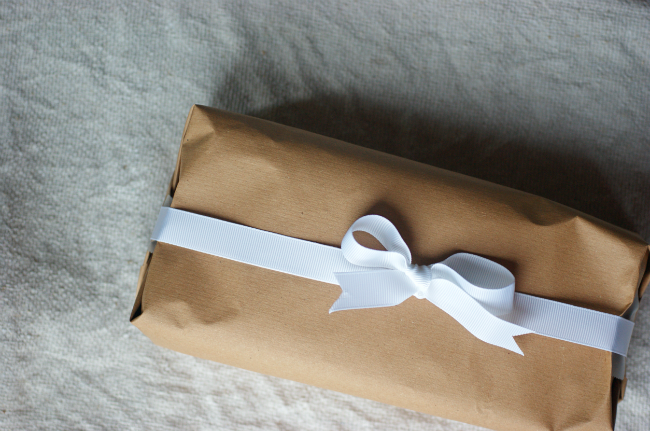 What a great gift. That is my favorite type of bouquet. Sometimes I leave a bunch of mint in a vase on my dining room table just for the fragrance. This recipes sounds delicious. Yum - what a thank you pressie. Love the photo of the herbs too. Your cake looks wonderful--I bet the lemon mint syrup was a great addition! Beautiful bouquet, and what a thoughtful gift! oooh lemon and mint and blueberry go so well together mmm! 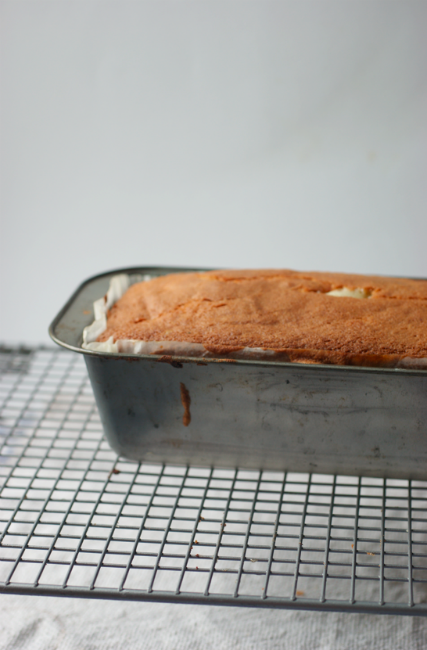 What a lovely cake and a simple recipe - just my kind of treat! that sounds so delightful! the lemon - mint syrup is something i would use all the time, wouldn't it be lovely in a bubbly drink? This looks absolutely wonderful. I think herbs are totally underused in baking, especially paired with lemon. And can imagine it works wonderfully with the blueberries, yum!